Protests took place all throughout Europe to voice our anger at the inaction of the international community and institutions well aware of the situation. 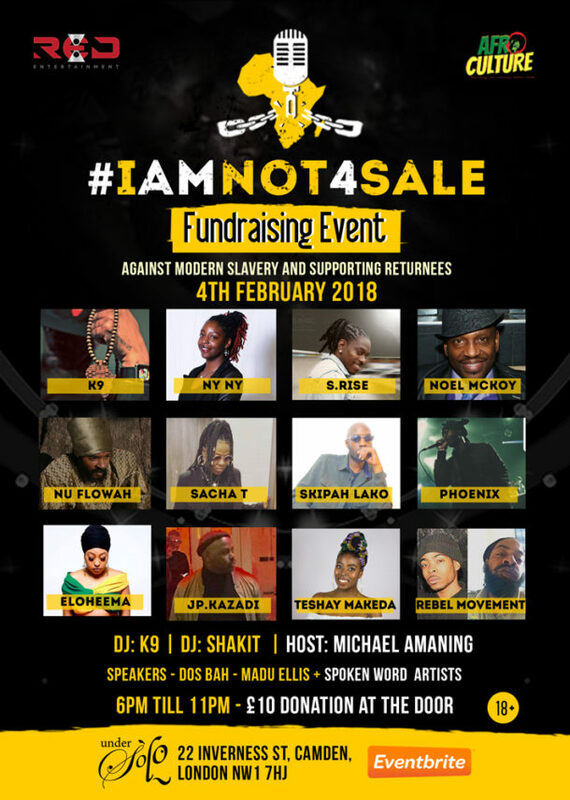 The founder of Red Entertainment alongside some of the artists performing in the event spoke to some of the returnees of the Libya slave trade during their travels to Gambia in December 2017. They found out their reasons for making the treacherous journey and putting their lives at risk. What they encountered once they crossed the boarder into Libya was of course inhumane. Many of our brothers and sisters, who are artists and passionate about the cause, are actively engaging to maintain the momentum as such issues die out mediatically and are put back on the shelf, nothing done about it! We are providing this platform and staging these events so that we keep on singing against slavery and not ….. just so, we are also proactively working to prevent “backway migrants” using the illegal route again by supporting initiatives on the ground, the 1st ones being in Gambia with partner organisations preventing their youth to undertake this journey to Hell and supporting returnees re-insertion in their communities. Your donation on the night will achieve all of this! Remember, the African diasporas send $160bn to Africa every year, at least 3 times greater than Foreign Aid. We can truly make a difference if we unite!! We will be touring throughout Europe in the coming months. Stay posted and BE THERE ON THE 4TH FEBRUARY 2018! Your presence matters!! Let’s stand for our brothers and sisters who cannot!